Size: 1,200 sq. ft. "Plus 400 sq. 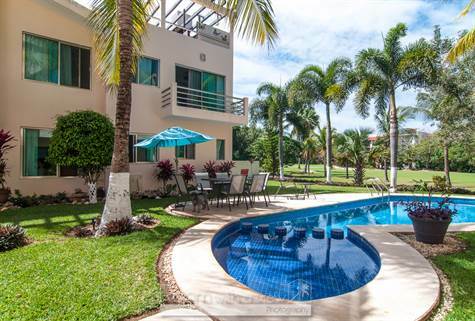 ft. Rooftop"
This beautiful two-bed, two-bath home is located in a residential resort community in Puerto Aventuras. On a quiet cul de sac, these condos are on the 3rd hole with views of the golf course. Residents of the property enjoy 24-hour security, beautifully manicured grounds and a community swimming pool. All this is less than ten minutes walk from sunny beaches, mouth-watering restaurants and many other convenient shops. The town of Puerto Aventuras is situated between Playa del Carmen and Tulum; just an hour south of Cancun International Airport. The town’s two marinas and golf course offer plenty to keep you and your guests entertained in addition to fantastic snorkeling and other water activities. Whether you want to explore Mayan ruins, experience unforgettable diving or enjoy the upscale shopping of Playa del Carmen, it’s all right at your doorstep. Inside this cozy, coastal home, vaulted ceilings lend an expansive feeling and allow plenty of light in. The charming interior is further enhanced by tile floors and polished wooden cabinetry that that offer plenty of storage space. The kitchen is ready for meal preparation, equipped with a stove and oven, washer/dryer and a refrigerator. The large master bedroom features a wide balcony that overlooks the immaculate landscape. Walk-in closets provide ample space for all your favorite tropical weather outfits and fishing hats. Upstairs, your private rooftop deck promises many delightful evenings and tranquil mornings. This is the perfect place for a first-time buyer, so contact our friendly agents for details today.